If you are a visitor to the rustic state of Arkansas, plan a unique ghost-hunting adventure and stay at one of Arkansas' historic haunted hotels. And if you are a resident of Arkansas, get to know your state's spookier side and embark on an exploration of the unexplainable and visit one of Arkansas' very own haunted hotels. If you happen to be near the Eureka Springs area, be sure to visit the Crescent Hotel, known to be the mother of super-haunted hotels. Eureka Springs, Arkansas actually has two hotels considered to be a hotbed of activity for the truly departed. The 1886 Crescent Hotel and the 1905 Basin Park Hotel. Both are beautiful luxury hotels offering spa packages, but what we like most is their haunted history. Beware of Room 218...This is the hotel to go to for a truly haunted experience. The historic Crescent Hotel is darn right proud of their haunted heritage. 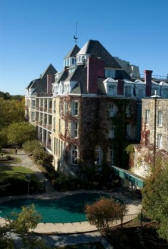 Its haunted nature is partly what draws guests to this beautiful, Victorian hotel set in the lovely Ozarks. After researching this hotel, we can't wait to plan a visit to this hotel! - and we are NOT taking any kickbacks from these people!!! "We stayed at the Crescent for two nights last March 2004 for our honeymoon. The first night I awoke to hear a child crying (there were no children on our floor). We later found out that many years ago a child had fallen on the stairs just outside our door and died a few days later." "The first night was uneventful... but the second night was quite different. I kept hearing noises, someone walking around the room, and the curtains kept swaying back and forth. I made the comment OMG if there is ghastly_tales_for_adults.htm in here will ya just do something. Well, the covers at the end of my bed were suddenly just jerked off my feet. I was so startled I jumped up out of bed got dressed and went downstairs and stayed there till almost daylight. I do agree this hotel has many haunts... MANY!!" There are so many accounts of hauntings that we do not have room to list them. The best thing is to go to directly to their website and check it out for yourself. That's their slogan! We swear! 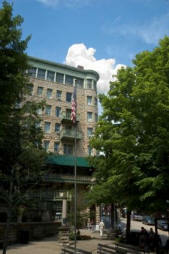 The beautiful Basin Park Hotel, located in downtown Eureka Springs, Arkansas has its own haunted history as its neighbor and sister hotel, the Crescent Hotel. 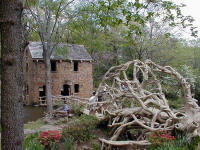 Located just about a half mile from each other, they share the history of Eureka Springs. 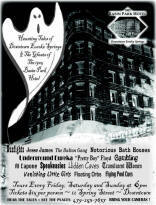 The Basin Park Hotel offers a haunted tour called "Haunting Tales of Downtown Eureka Springs & Ghosts of The Basin Park Hotel" as a chance to learn more about the many tales and fascinating stories of the history of Downtown Eureka Springs as well as possibly witnessing and/or capturing on film its next ghost story. The tours usually occur during the Halloween season. "Many guests of these historic times still remain as sighted visions: the translucent young woman with "cotton candy blonde hair and steel blue eyes", the little girl of age three or four in pigtails and a yellow dress, etc. There is documented phenomena of those guests who checked out but never left, floating orbs, pool cues flying off the walls, etc. Each still remains a fascinating mystery...but mysteries that can now be revealed."